When you think of something like “title insurance,” you might not necessarily associate the words “fun” or “interesting” with it. That’s completely normal because insurance is just one of those things in life that you need to (or should) have, regardless of how much fun it is or isn’t to navigate your insurance needs. At Title Partners of South Florida, we truly enjoy what we do for a living. By providing title insurance in Broward County, Miami-Dade County, Palm Beach County, and other areas in South Florida, our goal is to provide our clients with an engaging, easy-to-understand, and memorable closing experience. At the end of the day, we know that your main priority or interest isn’t in navigating the inherent legalese of title insurance, but we also know that your big purchase needs to be protected. It’s with your best interest in mind that we share our passion for providing the best title insurance services with you. To help expand your trivial knowledge about title insurance, we encourage you to keep reading below. If you have any questions about title insurance in general, or you’d like a rapid, no-obligation quote from Title Partners of South Florida, please do not hesitate to reach out to us at any time — we’re happy to help! Benjamin Franklin was a brilliant individual who is credited for the invention of several important things. Among these inventions is the advent of mutual insurance and insurance for private citizens, including title insurance for properties. Nowadays, title insurance and a plethora of other insurance services (policies are near limitless these days) are more important than ever before. Thanks, Benjamin! Though it took many years for use of title insurance to take hold, Franklin’s efforts were not in vain. In 1868, title searches were beginning to become guaranteed for accuracy. 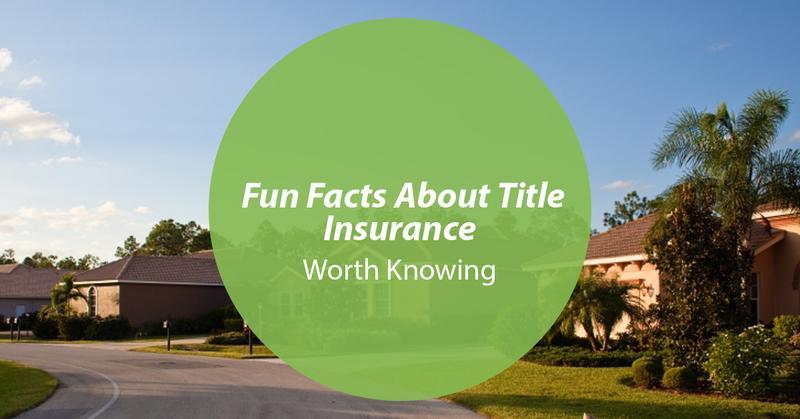 The first title insurance policy was issued three years later in 1871. Pennsylvania is an area that was heavily involved in the foundation of our nation, so it should come as no surprise that PA plays a major role in the history of title insurance. Indeed, Pennsylvania was the first state to instate a law that allowed title insurance. The term “conveyancer” might not mean much to people these days, but back in the early days of title insurance, conveyancers referred to those who first executed title abstracts. To be sure, these individuals really knew how to convey themselves in many different situations. Ready To Close On The Home Of Your Dreams? We’re Ready To Help! Remember, clearing your home’s title is an essential part of the closing experience to avoid any painstaking headaches down the road. Fortunately, our title insurance company serving Broward, Miami-Dade, Palm Beach, and other South Florida counties is here to assist you throughout the process. Get started today! ← Title Insurance – Is It Worth the Cost?